With that said, I still needed to share these pictures because it was an easy project that only took about an hour and felt so great. I know that having a smaller house(and therefore a smaller coat closet area) works to my advantage because there’s only so much space to cram things into, but it was still a process. I am well, well aware of how overwhelming organization around the house is. I don’t relate to FlyLady’s CHAOS(Can’t Have Anyone Over Syndrome) for nothing! But I’m a firm believer in starting small and doing a bit at a time and this is one of those projects that I could elaborate on in a million ways, but just getting it done felt so great. 1. I pulled everything out. As I pulled it out, I sorted it into piles of: Keep, Giveaway, Consignment Sale, Trash. Things that are too small for the kids but need to go to the size-appropriate bins in the basement. Here, only the things that we really love stay, other things that I don’t adore and get too small are given away or sold. 3. Things that needed to be put aside for the consignment sale went right to the bin set aside for those things in the basemeent. 4. Things that needed to go to Salvation Army went right into big bags and into the back of my car to drop off the next time we drive by. 5. Trash went right to the trash can. -We did this a bit ago, but wanted to share. We added a row of hooks on each side of the closet at kid-level for coats, bookbag, etc. Nothing fancy(we actually used hooks that were in the basement when we moved in, so it didn’t even cost anything), but it serves a great purpose of letting Amelia get to her own coat and hang it up when she’s done and allows for a few less pieces to be hanging on the higher bar. -We also have a hanging shoe holder on the back of the door. I’ve loved it for little hats and gloves and shoes this winter. Can’t remember where I saw the idea, but I’m so glad that I did! -More shelves. Another higher shelf above the existing shelf would be a perfect spot for storage of the hardly-used, but necessary, winter accessories. 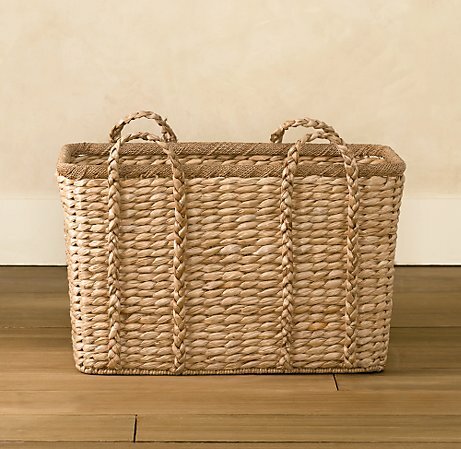 A lower shelf unit or bench below the coats would hold two baskets like these for some downstairs linen storage – tablecloths, throw blankets, etc. that just haven’t found a permanent home yet. like this or just keep my eyes open at thrift stores until I find the right size. So there you have it. Not perfection, but so much better and usable – that’s kind of what I strive for. And it resulted in more bags for 40 Bags in 40 Days – 1 bag of trash, 1 bag for the consignment sale and 1 bag for Salvation Army, bringing the grand total to 10 bags! Actually Walmart has some nice bins/baskets out this Spring that you might like. Thanks so much for that tip! I saw one for $5 in their craft section a few weeks ago, but it wasn’t very exciting. Not that it needs to be “exciting” to hold shoes, but it adds an element of fun;) So thanks so much for the suggestion – I’ll definitely have to go see what the new baskets and bins are! I SO need to do this. I really loved the hooks at the kids level~brilliant! I love coming to your blog. It totally motivates me to clean and organize our house (make rainbow cakes, etc). do you have a Michael’s? I got a basket that size with leather handles on the ends that we put Ethan’s toys in for about $20. love it! GREAT job with the re-org.